Along with dominating the Majors for more nearly two decades each, George Herman “Babe Ruth”, Henry “Hank” Aaron and Barry Bonds were the absolute stars of Opening Day in each of their respective ballparks. Fans came out in droves to soak up the Opening Day excitement, cheer their favorite teams on to a victorious new season, and watch their favorite sluggers dominate opposing pitchers. On Opening Day April 18, 1923, Babe Ruth walked into the recently built Yankee Stadium in New York and said "I'd give a year of my life if I could hit a homerun on Opening Day of this great new park." And he proceeded to do just that. Fittingly the first home run in the first game in the new Yankee Stadium came against Babe’s former team the Boston Red Sox. Even more fitting Ruth’s three-run blast gave the Bronx Bombers a 4-1 victory in front of a record 74,200 mostly-Yankee fans - an amazing number given that previous attendance record for a single MLB game was 42,000 for the 1916 World Series in Boston. As a response to Babe's opening day homerun, sportswriter Fred Lieb referred to Yankee Stadium in his column as "The House That Ruth Built". Ruth celebrated Opening Day and he knew how important it was to keep New York fans on his side by getting off to a good start. 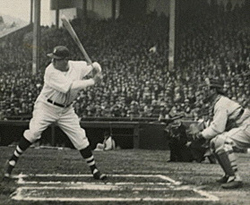 In 18 opening-day games, The Bambino batted .422 with seven dingers, five doubles, and a triple. So, after the spending the entire season savoring the prospect of catching – and then passing – Ruth, Aaron stood at the Riverfront Stadium plate on Opening Day April 4th ready to reach for immortality. Fans didn’t have to wait long for on his first swing of the game Hank crushed a Jack Billingham pitch over the left field fence to tie The Babe on the all-time list. 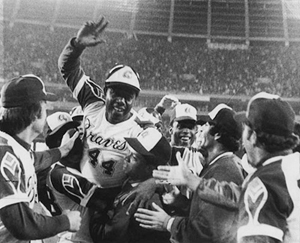 Four days later on April 8th, Hank and The Braves returned to Atlanta for the Home Opener before a national TV audience. He proceed to stroke a 1-0 Al Downing pitch over the left field fence for his 715th career homer and baseball history was made. 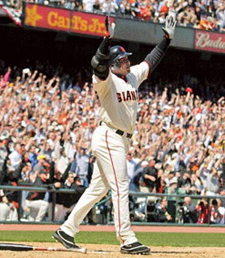 After hitting homers in five straight games to reach the 500 home run mark in April 2001, Barry Bonds hit two homers on Opening Day of the 2002 season and hit two more the next day, to become the first player to hit two in back-to-back games at the start of a season. He went on to surpass the 600 home run mark on August 9th of that year.